On a modern engine we use the term "Pilot", but this is a COW CATCHER! Nice red and black automotive paint and gold plated brass! Gold plating is pretty inexpensive if you polish all the parts yourself and then mount them on brass strips so the platers don't have to handle them. This also prevents tiny parts from getting lost. I usually fabricate cow catchers from hardwood, but MR. Gilday had this nice casting from Railroad Supply. These dome castings were very nice but still needed some cleaning up. The first thing was to cut off the mounting lugs and sand outlets. Then they could be chucked up in the lathe and turned and polished. After all the turning and polishing was done the mounting lugs and sand outlets were silver soldered back on. Then just a light buff on a cloth wheel and you can see the results. All the polished brass was gold plated on this engine, that way you could run it all day long and the brass wouldn't tarnish. Something to consider on an engine with this much brightwork. Here we are fitting the boiler jacket to the backhead wrapper. Make sure to allow for the thickness of the insulation under the backhead wrapper and use little #1-72 or #0-80 screws to join them. When fitting the boiler jacket to the backhead wrapper put a couple layers of masking tape between them to allow for the thickness of the paint, or you will tear you hair out later trying to get the holes to line up! 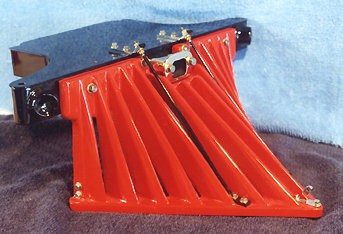 "American" photo "Forming Backhead wrapper"
A backhead wrapper is something that will add to the appearance of a loco and perhaps also the performance, as you can put some insulation under it. This wrapper was made of .032" copper. I now make them from .062" copper as it doesn't wrinkle so easily. Make a form out of particle board or MDF (medium density fiberboard). 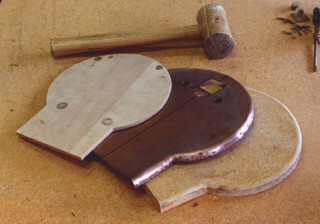 Hold it in place on the form with a piece of 1/4" plywood and some "C" clamps. Then start working the edges over the form with a rawhide mallet. Don't use a metal hammer or you will put dents in the copper! 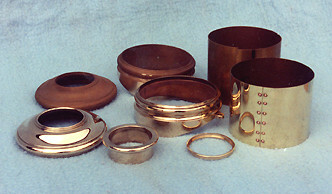 You will have to remove the copper from the form and anneal it a several times by heating it to dull red and quenching it in cold water. The colder the water the better, I use ice water. Here is the firebox wrapper for #40. 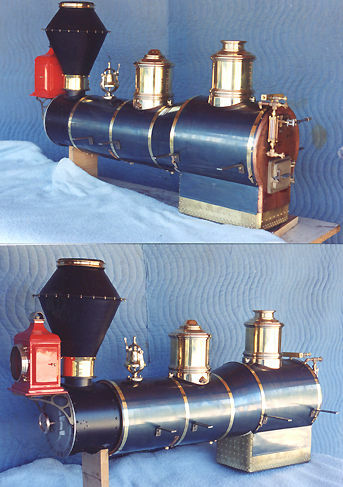 A firebox wrapper is a fairly simple way to improve the appearance of most any steam loco, even a narrow firebox engine, but will greatly add to the appearance of a modern wide firebox engine. 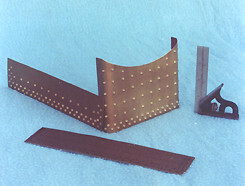 This wrapper is made from .020" shim brass. The rivets are just embossed as there isn't room between the frame and actual firebox for real rivets. On a steam loco with hollow stays you can use 3/32" pop rivets to simulate them. There just wasn't room here. Here we have all our work making wrappers and such starting to pay off. You can see how the backhead wrapper trims out the boiler in the cab. 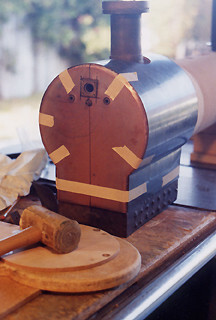 And also how the firebox wrapper gives the boiler a prototypical look, not nearly as important on a narrow firebox tea kettle as a modern wide firebox engine. This is one detail that really pays off! copyright © 2004, Jack Bodenmann, all rights reserved.